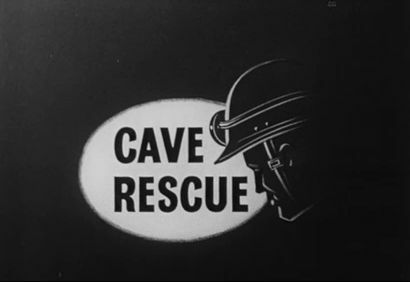 The Upper Wharfedale Fell Rescue Association Cave Rescue film was released in 1964 as a means to get across to the general public the difficulties encountered during a typical cave rescue. It was conceived by Ted Winpenny, the Press Officer of the Association. The 21 minute long film is a dramatised account of a cave rescue. It was scripted by Winpenny, and filmed on 16 mm black and white film by freelance photographer Peter Jackson from Huddersfield using an Arriflex camera. Lighting was at first provided by a portable generator, with several hundred feet of cable feeding 240 volts to the film location, although lead acid scooter batteries were later used. A variety of locations were used, including Goyden Pot, Hell Hole, and Dow Cave. The ladder climbing sequence was filmed at How Stean Gorge at night. Although used principally to help with raising funds and for education, it was also shown at the National Film Theatre, went on to win the top award with the Scottish International Film Festival and was in the top 10 amateur films of the year as judged by Amateur Cine World. Largely as a result of his efforts Peter Jackson went on to become a Lighting Cameraman with Yorkshire Television. Two copies of the 16 mm film are held at the Yorkshire Film Archive, and one is available for viewing on their website. More information about the making of the film is to be found in the book written by UWFRA members and published in 1984, Anytime...Anywhere: the First Fifty Years of the Upper Wharfedale Fell Rescue Association.